Firsts in life are a big deal. Like a child’s first step, a First 5K Race is a big step in life. It doesn’t matter if you are 7 years old or 70 years old, you deserve a finisher’s medal when you finish your first 5K road race. As a runner, you know how much work and determination it takes to run your first 5k race. As a parent, spouse or friend, you know how hard your runner has worked to prepare. Many races only provide medals to the top finishers. Every runner does not get a medal. For a first time runner, this can be a disappointment. 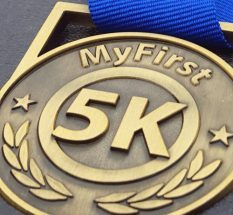 Make sure your runner has a great experience at their first 5k race and order a My First 5K medal for them. Why don’t all races provide medals for all finishers? Most 5K races are fundraisers or donate a portion of their profits to non-profit organizations. The cost to produce a race has risen faster than registration fees and race directors had to find ways to control costs. A medal for each runner was one expense that many races eliminated. Race directors had to balance the need to provide a great race experience with their commitment to raise money for their non-profit sponsors. When a non-profit commits staff and resources to produce a 5K road race, they need to have something to show for their expenditure of time and funds. In a 2005 Cool Running article Boston Marathon Race Director, Dave McGillivray, gave an example of the costs to produce the average 500 person race. He included everything from t-shirts to toilets and came up with a cost per runner of $20.30. In 2005 the average 5K entry fee was $20.00. Twelve years later, the average 5K fee is $30.00. Dave’s estimate did not include awards or finishers medals, and his race still lost 30¢ per runner. The $30 collected per runner today doesn’t go much further than the $20 collected in 2005. In addition to inflation, races have become bigger productions and most provide tech shirts instead of cotton. Dave’s 2005 article indicates that not providing a finishers medal is a long-standing practice. So even in 2005 race directors felt the need to eliminate this expense. Any race needs runners to show up in order to be successful. To attract the bulk of veteran road racers, races have to keep fees in line with other races. Veteran runners also expect a well organized race with water, some food and a nice shirt. If a race cuts corners, runners will notice and may not return the next year. Recent surveys indicate that experienced runners would rather keep entry fees low and not receive a medal. Many would go without a shirt to keep fees low. Race directors know this. Some races do not include a shirt with registration and most have eliminated a medal for all runners. Each year, millions of people lace up for their first 5K road race. For them every step along the way has been an adventure in the journey to their first race. We all grew up watching medal ceremonies at The Olympics and The Boston Marathon. Every first time runner wants their personal moment of victory. Not receiving a medal at the 5K finish line is like leaving the exclamation mark off of “I finally did it!”. It’s a no cake birthday. First time runners have seen the medal ceremonies and felt the excitement. They want to feel that excitement for themselves. For race directors, providing a medal, keeping fees low and raising funds is a challenge. This is a limited edition finisher’s medal designed exclusively for first time 5K runners. You can order one for your runner or for a group of runners. Just click any image on this page to place your order. Race directors can add the medal as a registration option for runners. The medal is a great fundraiser with little effort on your part. Race Director Details. Thanks. Most people who have run more than a few of these are not in it for the hardware. My first race was a half marathon, so we got a medal. I guess I was lucky and foolish enough to run a race distance that typically provides a medal. I don’t have any hard data, but I bet a lot of people are “one and done” with the 5K. The medal symbolizes an accomplishment like climbing Everest for them. Or having a baby. LOL. The ladies will kill me on that one! I think that for people who have clients visit them in their office, having a medal on the wall is a great conversation starter and ice breaker. Just my thoughts. This looks interesting. Do you want to discuss off line? My email is info@omnirunning.com. We can exchange numbers and talk. While a medal at my first 5K would have been nice, I chose that race knowing I wouldn’t get one. It was a race in my hometown and running my first race there was special enough. They did give out a really nice medal to the kids who did the fun run, so my daughter has an awesome “first” medal. This is a great gift idea though. If my husband had greeted me with this medal when I finished I probably would have bawled right then and there. I know it’s not for everyone. i think a spouse buying one to suprise their running spouse at the end of a race would be pretty cool. roses end up in the compost pile, a medal is forever! If that race in your home town is interested in this let me know. I’m trying to make the process of offering these to runners easy. It’s the Frederick Running Festival. I think they are managed by Corrigan Sports. They also manage the Baltimore Running Festival. Thanks. i’ll send the race director an email. I think this is a great idea. I’m not much on medals myself (although I love my Nike Women’s Half medal/necklace), but I know a lot of runners are. There are many, many new runners for whom a 5k is a personal triumph for so many reasons and I think it’s worth commemorating in a special way. Thank you. My first race was a Half Marathon so I received a medal. I still have it and every time I look at it, it brings back memories. A first race is a milestone in life. For some people it is a “one and done”, a goal achieved. For many of us it is the beginning of a new chapter in our lives. Love this idea. My first 5k I chose because it had a medal (it was the same for the 10k and half marathon) but they offered little else. That same company still has other races in other states but has not been able to successfully run another race in GA. I personally love the bling and sometimes I race just so I can get a certain medal. Oddly with Ultra running the medals are usually extremely distinct and I love whatever the race is offering. Guess I am in-between philosophies right now. Of course I suddenly want belt buckles, but that will take some time. I heard about the belt buckles. I wonder how they came up with that idea? I’m doing my first two races in November. Everyone I talk to loves this idea. I think I just need to get out there more.